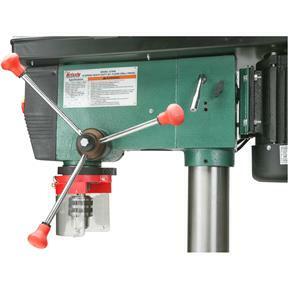 When this drill press arrives at your door, you're gonna say "Holy Moley!". 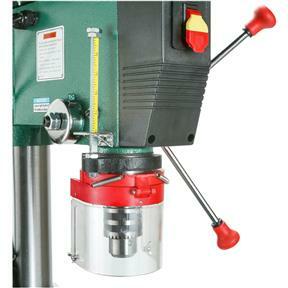 The MT #4 spindle taper, 1-1/2" HP motor and precision-ground T-slotted table will handle just about any drilling job. Includes built-in light (bulb not included). CSA certified meeting CSA C22.2 #71.2-10 and UL 987-8th Edition standards! Table size: 18-3/4" x 16-3/4"
Approx. shipping weight: 317 lbs. Bought this a month ago, very easy setup (was able to do it alone but best use a buddy), 90 degree marker on table was truly 90 degrees, was able to drill perfectly intersecting holes through both sides of a 9 inch board using a 3/8 brad point bit with no noticeable lip and was then able to drive a 3/8 diameter x 5 long piece of steel bar stock easily through the 9 hole... that is to say the holes it drills are plum. Belt changing is easy. 4-1/2 quill travel is definitely very useful. I bought this drill press a month ago and am very happy with it. I have had some cheaper models and nothing compares to the Grizzly. I use it in my wood shop and know that I'll have many happy years using it. Thank you for selling such quality products. We purchased this drill press several weeks ago. I have been impressed so far with the quality of this machine. Very satisfied, nice well built product works well. I recommend the stand as well very handy, makes it nice to move around. 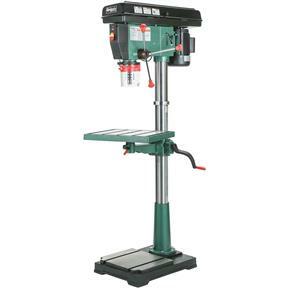 I have had this drill press for a month now and it is a great machine. By far and large the best buy for a machine of it's size. You definitely need another person to put the head on the column though. It's heavy and solid. I upgrade from a 1940 model delta to G7948 12 Speed 20" Floor Drill Press. it was a grate choice. standard voltage is 110 VAC however it also can be wired for 220vac but the built in light can't be converted and therefore can't be used. both 110 and 220 prewired options need to be offered. 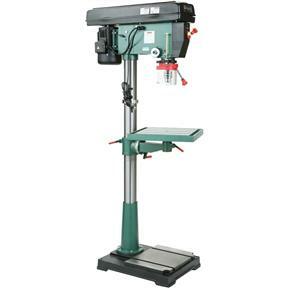 Our company purchase the G7948 model drill press a few years ago and have been very happy with it. 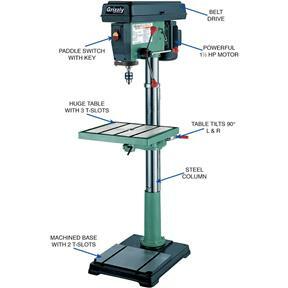 This past winter we needed another drill press at a different shop so we purchased one exactly like what we already have, because of its outstanding reliability. After the owner saw the new purchase he said to order another for his shop. I purchased this a month ago to use in my fabrication shop. I dont care for the plastic nut that holds the main pulley in place, I am having issues with it coming loose after use. I will be replacing it with a metal nut ASAP. The light on the press doesnt work even after a new switch assembly. For the price point it is a decent machine. Sturdy drill press. Has the quality of a more expensive drill. Expect many years of use from this. We received the drill press very quickly, in great condition, and in time for his Christmas present. Although with this cold weather, we have not unpacked it yet. I'll update the review in a month or so. 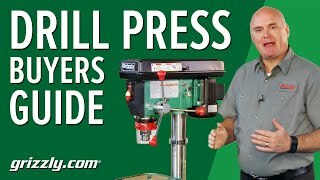 I have had my drill press about a month and have used it several times, never disappointing....I wanted more power and used it for a 4" forstner bit yesterday, it did not stutter....I am still adjusting to the increased power. I am well pleased. Put this into our steel fabrication shop for misc. small drilling operations. So far it has performed well, it is a good value and we're very satisfied with our purchase. The belts are too tight so can't change speeds, and it would be nice if there was a clamp for the spindle. Belts are VERY hard to change. For the price, you should not have to be changing belts on spools. This is a pretty clunky machine. Everything came fine and it assembled without issue. There are two small items I would improve on this unit. One would be to include a chuck key with a longer handle. The chuck is pretty large but the chuck key has a short handle and would we benifit from a longer handle. The same goes for the belt tighening handle which I used a short piece of pipe to get better leverage to tighten the drive belts. I also have an improvement idea. Epoxy a Neodymium magnet on the top of the check key. It will then stick to the cast side of the drill press head and always be handy. I've needed a larger drill press for a long time. But after making due with my little bench top unit and experiencing less than stellar results on a recent woodworking project, I finally reached a point where I absolutely needed the greater throw of a bigger machine. Quill travel was also important, as was table size. 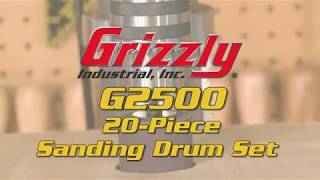 I looked at the big Delta, the comparable WEN, and several other brands but went with the Grizzly based on previous experience with their stuff (8" jointer), price, and the Fine Woodworking review article. The drill press is very stable, well built, and will probably do just about anything my woodworking projects throw its way. I just shouldn't have waited so long to buy it. Very heavy and strong drill press for the money. Will easily turn 1/2" bit in 3/4 steel plate at mid range RPM and still through out large shavings. Very impressed. Just have some help or a hoist to put it together. It is a good drill press but I wish I had bought a milling machine instead. This machine has a wide speed range and plenty of power. The only item I have reservations about is the chuck. I may replace the chuck with a deluxe chuck. The safety key is a nusiance. I have never turned on a drill press before removing the key. I suppose there are people that can forget that. Bottom line is, this is worthy of your consideration. I did say something like "holy moley." It was pretty easy to put together by myself. Everything feels very substantial and operates smoothly. I love the large table. I think it looks good in the shop and it didn't break the bank. Does what a drill press should do and doesn't stop. Very happy. I have two of these in my schools shop and the first one is still running strong after 20 years of student abuse. 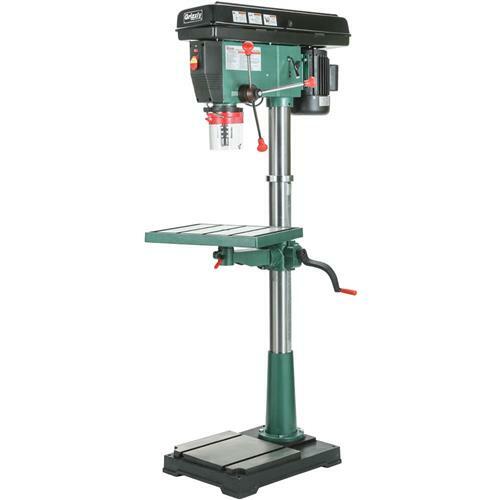 This is the perfect drill press for the home shop. Nothing fancy just right. 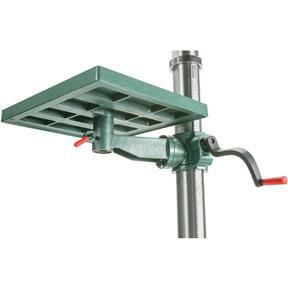 The big table is perfect for holding a vice or large items. The speed change is a bit of a nuisance but it didn't cost $2000 either. really like this unit, belts delivered with it are junk, guard went in the can immediately, but it is solid! As others have described this machine is a beast. I used my engine hoist and a piece of 2" webbing strap (use a Water Knot) to slowly lower the head onto the tube. I highly recommend this stress free, muscle free method. The base, table, and tube are not a concern for one person to lift. But as a complete assembly, maneuvering this DP into its final position is hard! The information / manual, states that the machine works on either 110 or 220 BUT, the unit comes with a 3 wire cord (line-line-ground). So you can't run the unit on 220 AND use a light. Good news is 110 seems sufficient, and later on I will add a second cord just for the light. 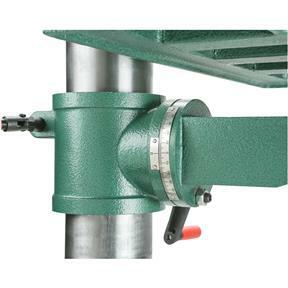 I would recommend a 5/8 T-Slot clamping kit (like G1076) because this DP could spin a tank and a good drill vise (such as Wilton 13402). I have had this drill press for about 4 years and I have put it though its paces. Its OK, its powerful, but it has flaws and limitations. I bought it originally for its 4 ¾ spindle travel because I wanted to drill accurate holes in 4x4 hardwood posts to accommodate a stainless wire cable system for the new guardrail on my deck. It worked well for this. I have since used it on various metalworking projects, including gentle milling. I have a Shop Fox sliding vise that works quite well, although it is a little sloppy. I have two main complaints about the drill press. First the belt changing and tensioning device is terrible. 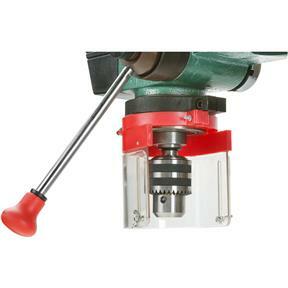 For example, it takes forever to switch speeds between drilling a pilot hole and the full size finish hole. 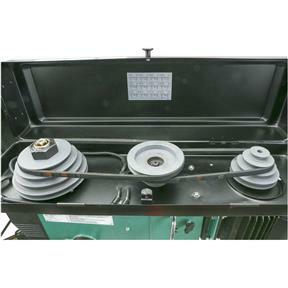 The central idler pulley often hangs up, just to slow the process even more. Belt tension is accomplished by sliding the motor backwards horizontally (in theory). In fact, the slides are so sloppy that the motor rotates skywards so that the axis is tilted causing excessive belt wear, especially with the small, slow speed pulley size. Also, during slow speed, high torque applications the head will stall due to belt slippage. My second complaint is about the red knobs at the end of the feed spokes. These are mounted on flimsy plastic bushings all of which have cracked causing the knobs to fall off. Fortunately the spokes have 12mm threads which allowed me to machine replacement aluminum bushings. Overall, despite the limitations, I would recommend this tool for the price. Thanks for the review. I almost purchased but reading your review I think I'll keep looking elsewhere. Not that I don't like Grizzly. Very good company which I love products I have gotten from them. You can't make as many tools as Grizzly and have them all top performers is my thinking towards the company. Best damn planers out there for the $$ and quality imo. I got my shipment with great service by the driver who was very helpful. When I went to assemble the drill press it was suggested to lay it on its side and install the top part and then get three people to stand it up. I could not find three people so I stood it up by myself and when the blood and oxygen got back to my brain, I finally realized how big the drill press really was! I had reservations about the drill press because it was made in China but it looks to be good quality. The fit and finish was good and no sloppy joints. I'm very happy it went together so nicely. Really good stuff so I'm working on a second order! Keep up the good work and hope to see you at the tent sale! Also, very good service from all the people I talked to at Grizzly. A most excellent company to do business with. Not one cranky person at Grizzly. Good job and thanks!